This weekend, I have both days unscheduled with events, which is rare. 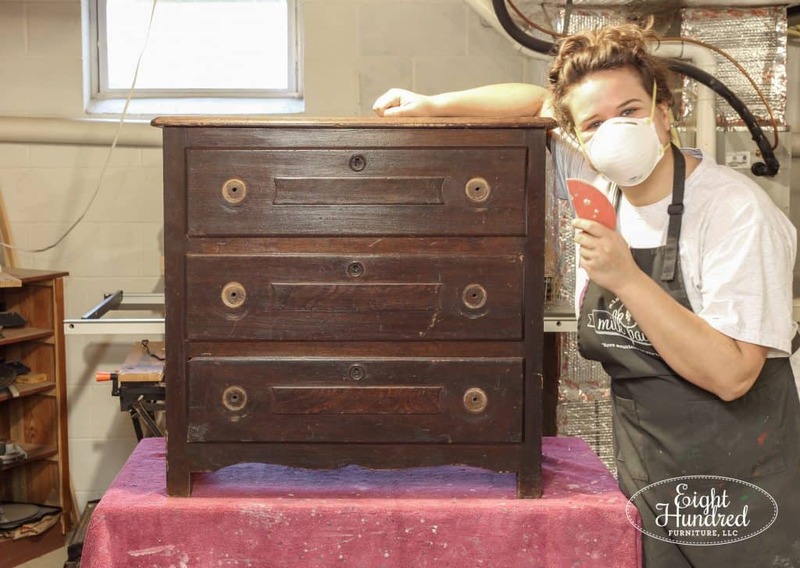 To make the most of my time, I’ve been busy in the workshop getting 3 pieces ready for milk paint makeovers. 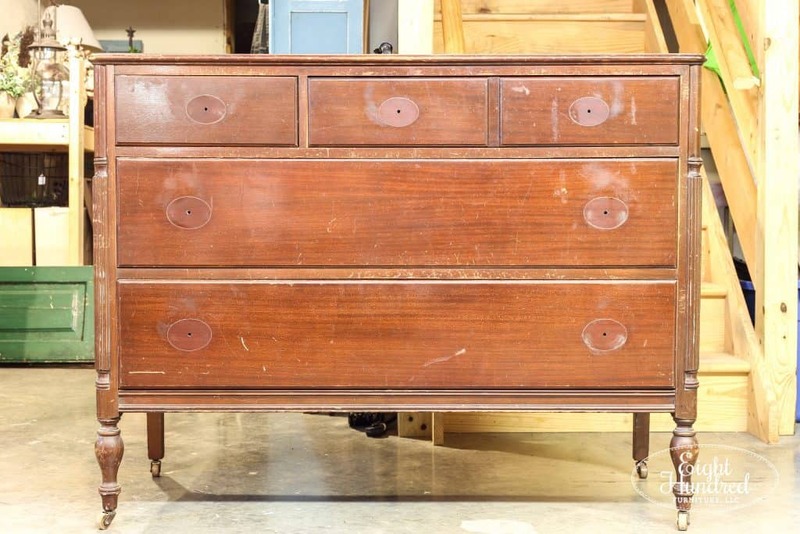 I picked this dresser up at a used furniture store that’s not too far fromMorgantown Market. It was priced under $100 and is in great shape. It has these cute little glove boxes on the top, which I couldn’t resist. The little feet in each corner are just too cute! The dresser is made of walnut and it’s very heavy! Marc and I can’t move it without taking all of the drawers out. 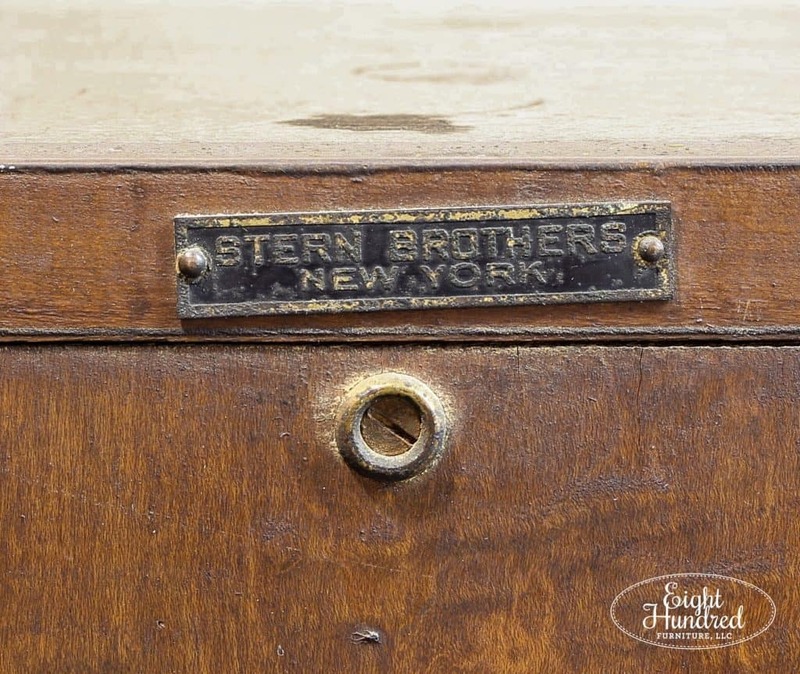 The dresser was manufactured by a former department store called Stern Brothers in New York. 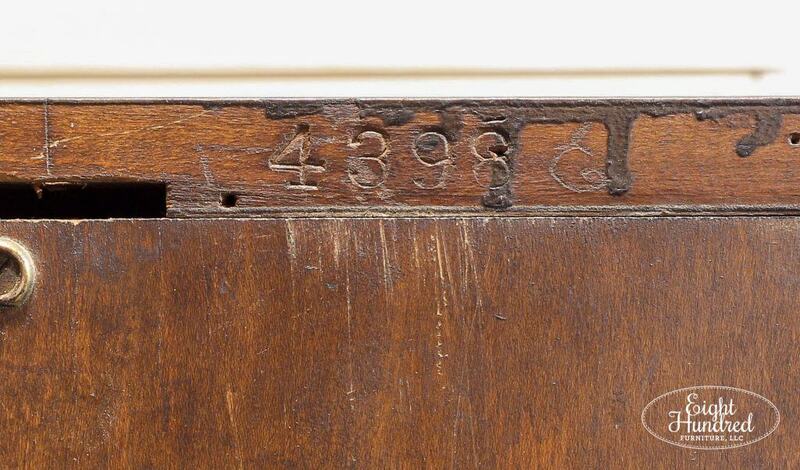 The model number is stamped on the back of the dresser. And then there’s this label on the back too, so I’m not 100% sure what it all means. 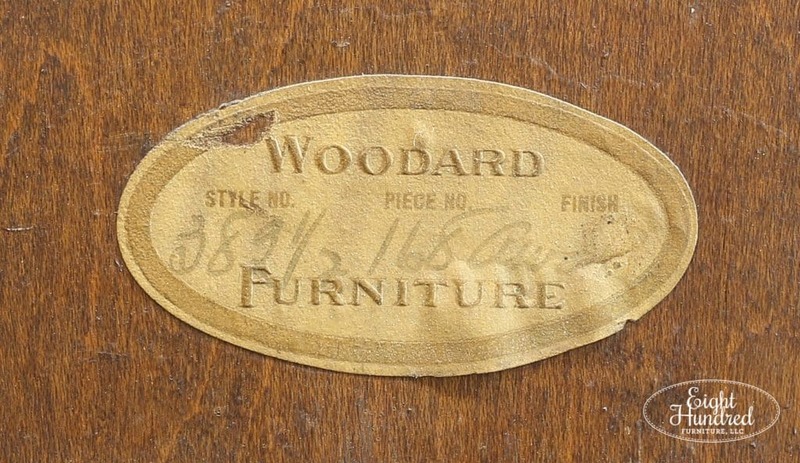 I just like looking at the writing and taking time to appreciate the history that comes with some of the pieces I find. I started the prepping process by removing all of the wood knobs. I’ll be replacing them with new hardware, so I didn’t save them. 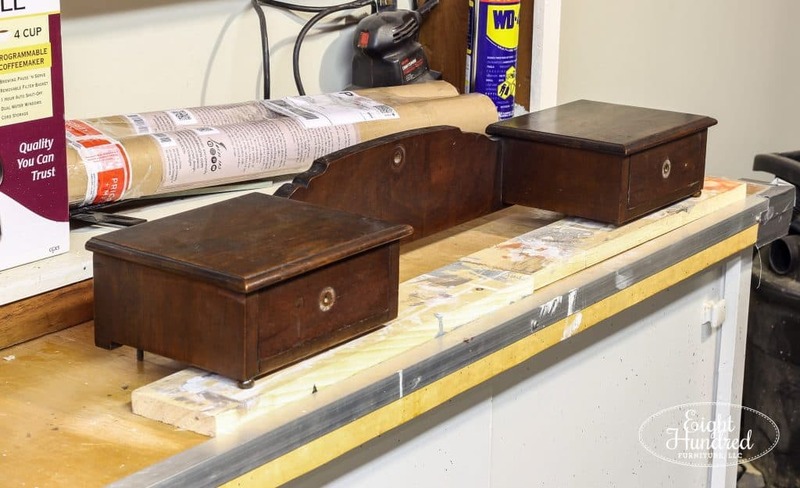 Then, I separated the glove boxes from the main body to make painting easier. 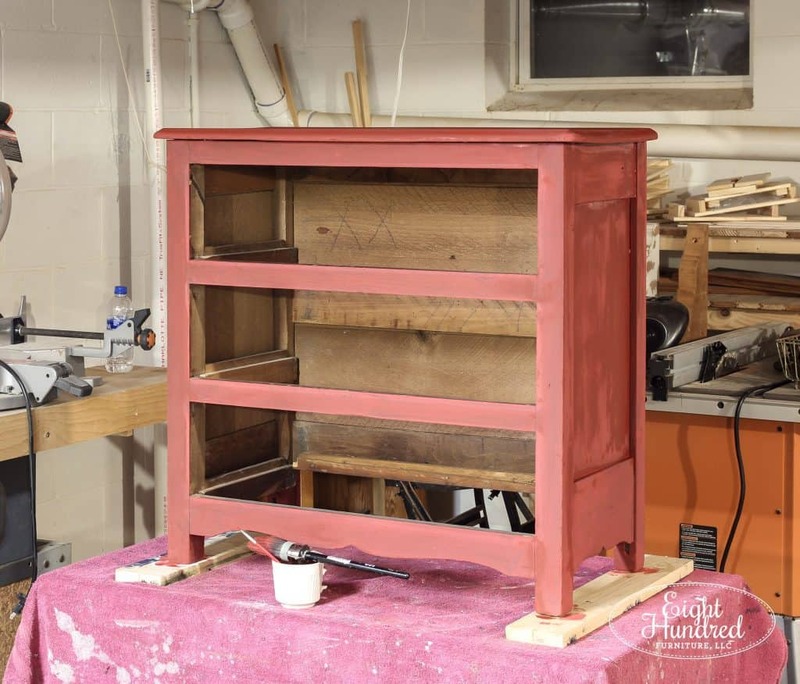 I’m planning on painting this piece with General Finishes Milk Paint, so I followed their recommended prep schedule as outlined on their website and YouTube channel. 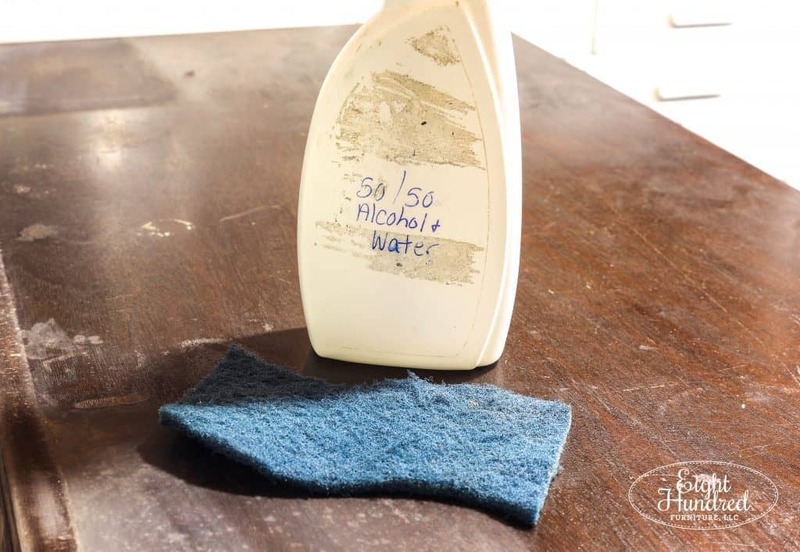 First, you clean with a 50/50 mix of denatured alcohol and water using a Scotch Brite pad. Using this as opposed to TSP or mineral spirits has a few upsides. First, denatured alcohol is easy to clean up and doesn’t require special disposal like mineral spirits. It can be used under water and oil based finishes, making it a no-brainer cleaning product to choose. It’s inexpensive, dries fast, and is effective. Now sometimes you’ll get what’s called blush marks when you use denatured alcohol to clean your pieces. This means that the existing finish is lacquer based, and all you need to do is sand that off in the next step. 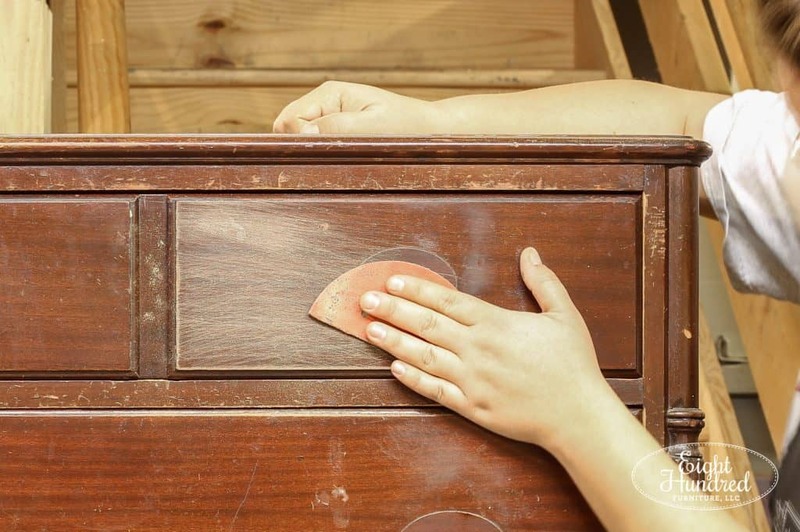 The final step of prepping for GF Milk Paint is to gently scuff the piece with 400 grit sandpaper. This is a very fine grit that is often used for finish sanding. 400 is recommended because it doesn’t create an aggressive scratch pattern and it further cleans the surface. 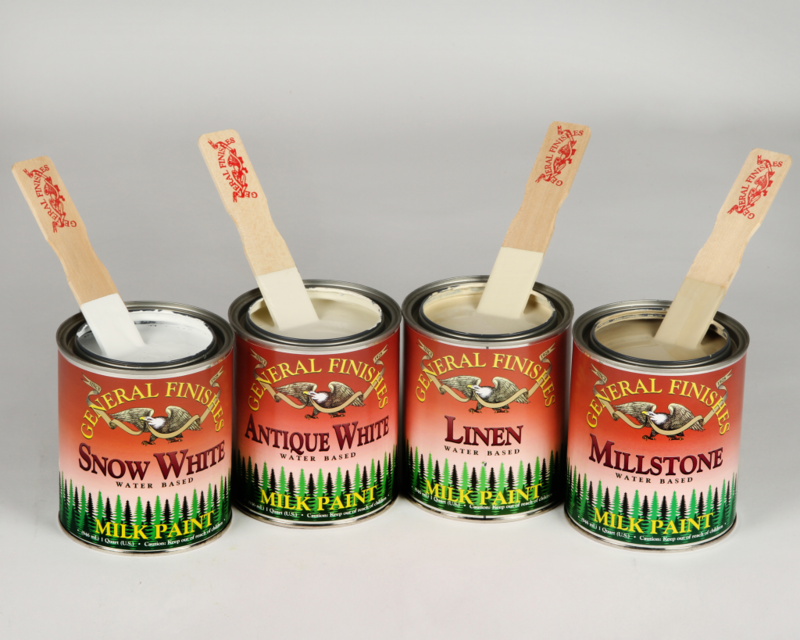 When you are using GF Milk Paint, sanding is not required for adhesion! This brand of paint has excellent adhesive properties. Sanding is only required to further clean the piece. 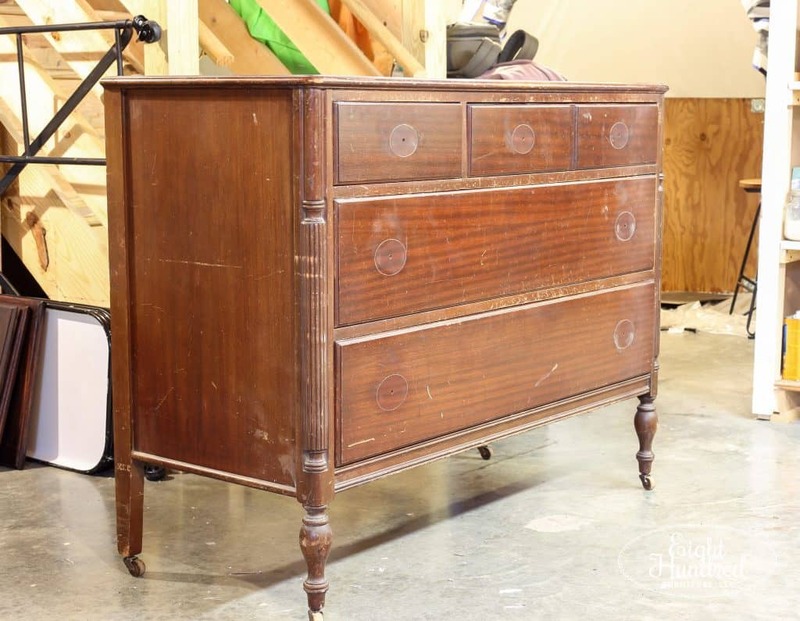 This dresser was 1 of 3 pieces that I purchased in a set from a very sweet woman about 45 minutes away from where we live. She came to Morgantown Market one day looking for a buyer and the owner of the shop graciously gave her my information and I happily accepted once I saw how pretty the pieces were. 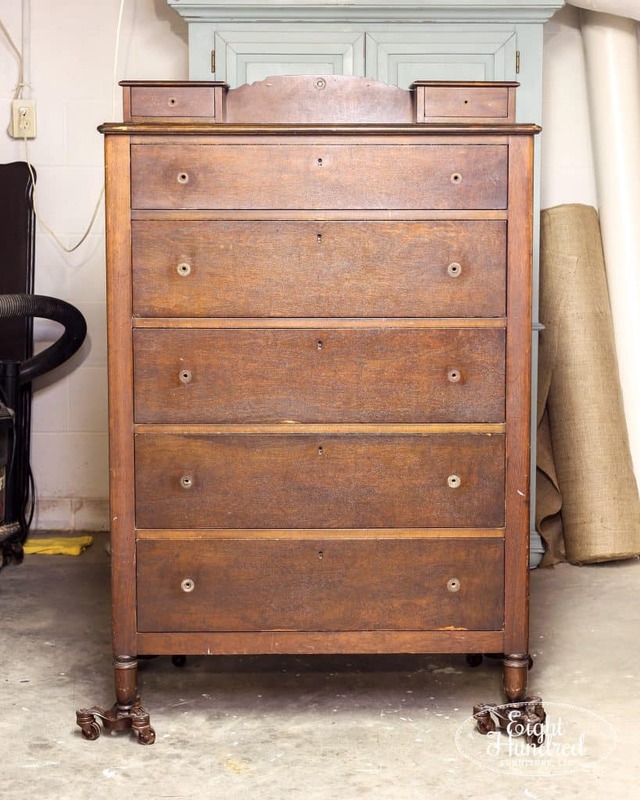 This dresser belonged to her mother who saved up and bought it with her husband when they got married in the 1940’s. How sweet is that? 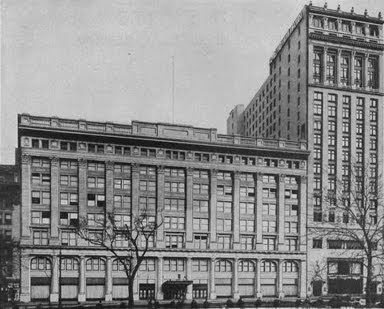 The finish on it was mahogany, which is famous for bleeding through light colored paint. There was no way I was going to touch this without priming, and priming is probably my least favorite thing to do, so I went with a darker color instead. 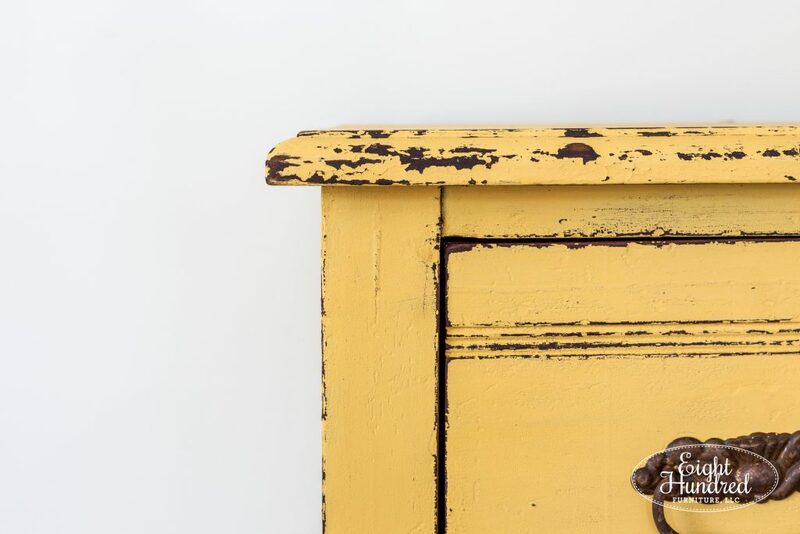 I decided to paint this guy in Miss Mustard Seed’s Milk Paint, which is completely different from General Finishes Milk Paint. To read my full comparison of these two types of paint, click here. 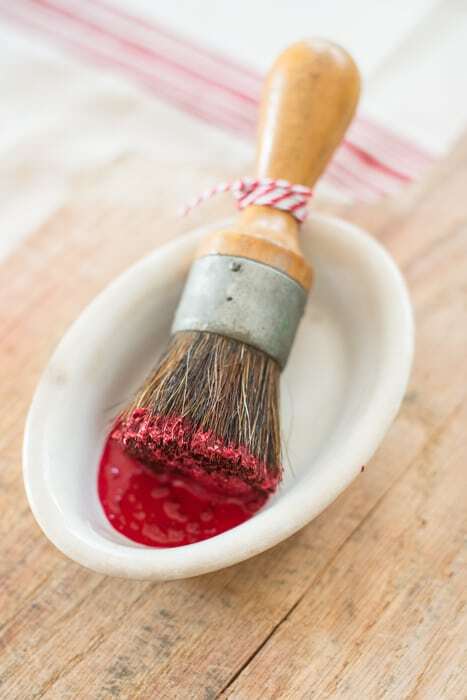 In a nutshell, MMS Milk Paint is a true,powdered, casein-based milk paint. 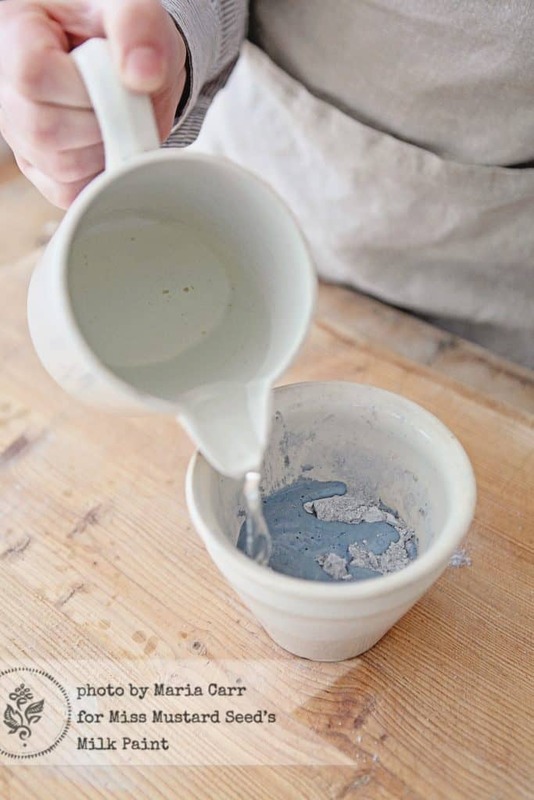 It has powdered milk protein in it (hence the name milk paint) and it’s mixed with water. It has a thin consistency and naturally resists adhering to smooth and shiny surfaces, producing the charming “chippy” look. It soaks into raw wood like a stain and is very simple and basic in its ingredients. 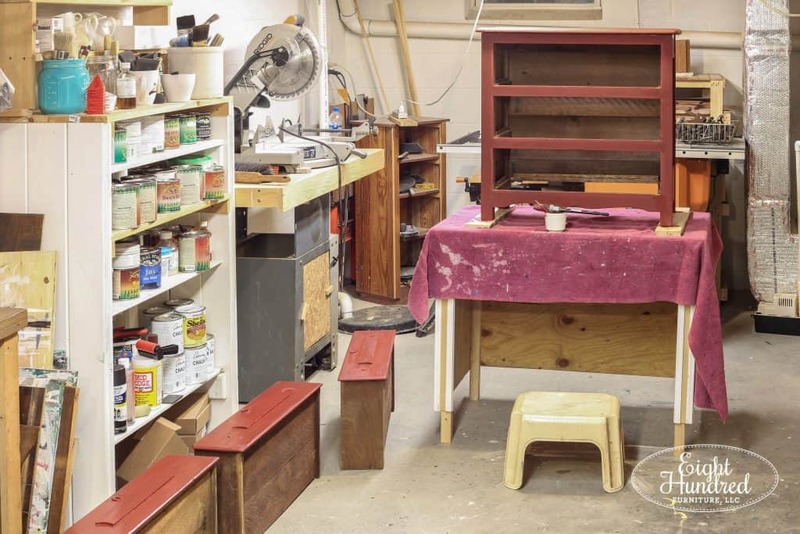 The preparation process for Miss Mustard Seed’s Milk Paint is different than General Finishes. 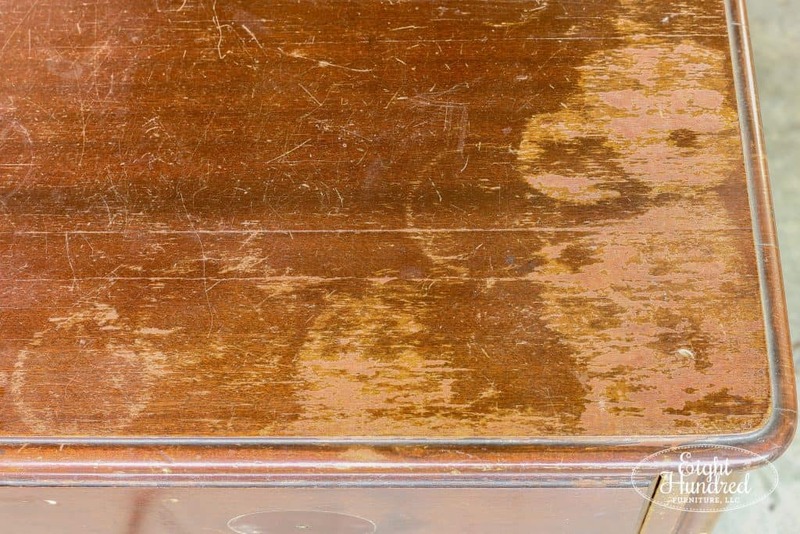 The scuffing part is a bit more extensive, depending on the existing finish of your piece. Mine was worn, but it was still shiny. So I grabbed 100 grit sandpaper and began scuffing the entire surface, working at that shiny finish. Now I didn’t mind if this piece would up chipping here and there, so I didn’t scuff every single square inch of the dresser. 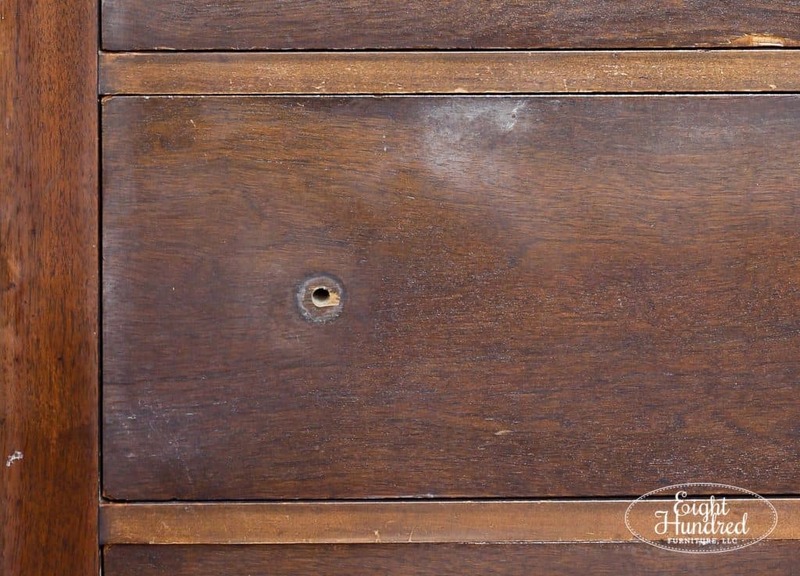 This is what scuffing looks like for MMS Milk Paint. See how it’s a bit more aggressive? Once the piece was scuffed and cleaned off, I mixed up a custom blend of 2 parts Flow Blue, 1 part Boxwood and 1 part Artissimo. I was getting bored with using the same old colors, so I decided to experiment! The color is really pretty, but you’ll have to wait to see the full reveal! The 3rd piece that I prepped yesterday was this handsome little fellow. He sits just shy of 30 inches tall, making him an ideal nightstand sized piece of furniture. 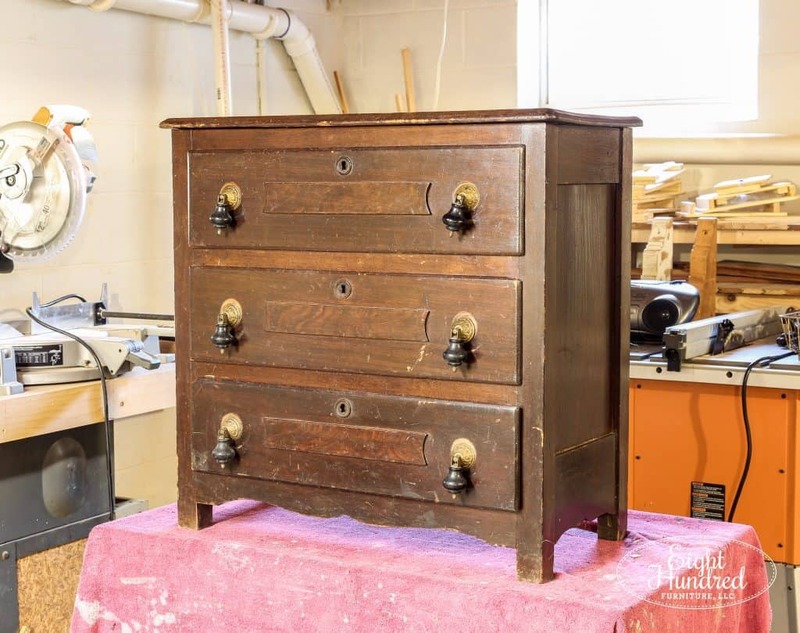 I bought him from Morgantown Market at a great price and I planned his makeover around those incredible original ebony and brass drop pulls. 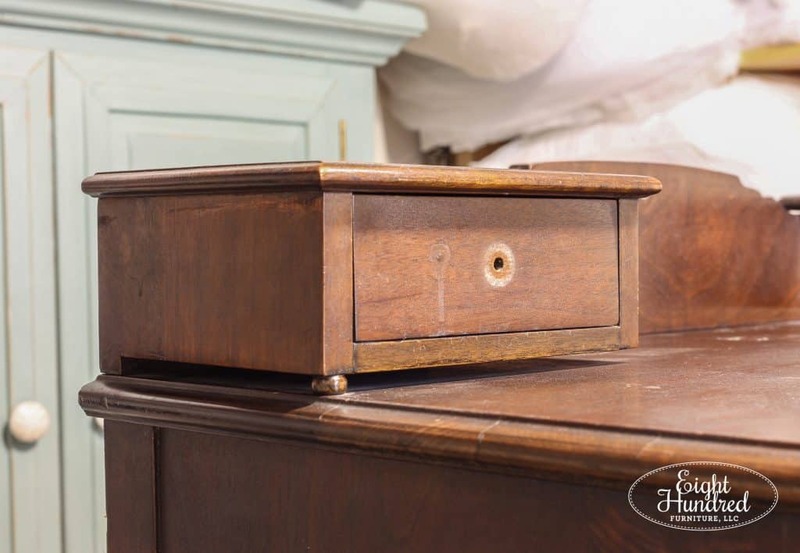 This piece was also going to receive a MMS Milk Paint makeover, so I used the same 100 grit sandpaper from the mahogany dresser to scuff sand the surface. This goes without saying, but you should ALWAYS wear a mask when you are sanding. See how the scratch pattern is much more aggressive when you’re using a lower grit? I thought red would look amazing up against those drop pulls, so I mixed up a blend of Tricycle with a touch of Curio to darken it slightly. When I came upstairs from working last night, I had 2 coats painted on and everything was drying. Can you see how pretty this one is going to turn out? Stay tuned over the next few days to see how each of these pieces finish up! Fancy meeting you here! I'm Jenn Baker and welcome to Eight Hundred Furniture! My business is named after the square footage of my first apartment. 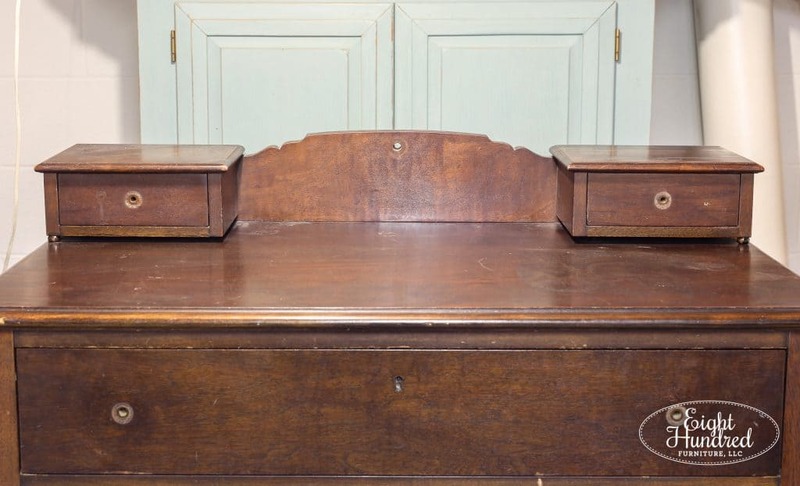 I had lots of hand-me-down furniture that was high on quality but low on style. 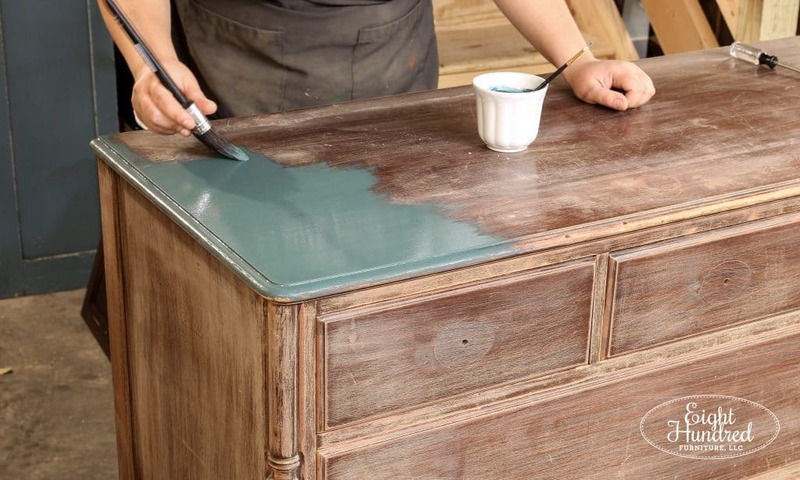 I taught myself how to paint furniture out of necessity and soon it became a side hustle. Once I married my hunky hockey playing husband, Marc, I was able to quit my job in education and make a full-time go of painting furniture professionally. No matter where we have lived, I have always worked out of an 800 square foot space, proving you don't need a fancy setup to create beautiful furniture. I'm a lover of good quality coffee, cat snuggles from Jake, our white truck affectionately called "The Marshmallow" and anything that has a cow on it. One day I'll convince my husband to let me own one. 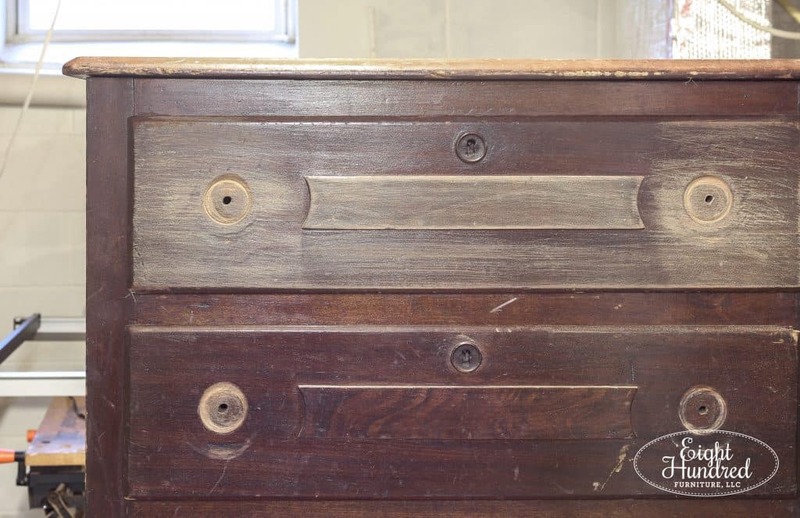 You'll most likely find me head-deep in a dresser getting cobwebs out or nerding out on the fabulous features on a dresser I spied out of the corner of my eye. I make U turns for pieces on the side of the road and have no shame in digging for treasures in antique shops. I'm so blessed you're here and it's my pleasure to share my Eight Hundred-sized world of furniture painting with you!